”It is Christmas Eve – ring, bell, ring, Bing, bang, bing – bing, bang, bing. Soon the tree is lightened, make a ring, Dance and hum and sing!” There is hardly any Faroese who does not immediately recognize the cheerful chorus of the song "Hví man tað vera so hugnaligt í kvøld?" (Why is everything so cozy tonight?). For five decades we have heard the two siblings Kári and Elin Mouritsen sing the merry song, accompanied by guitar and banjo, from a Christmas broadcast on Faroese radio in 1957. The two young singers have long since grown up, like the rest of us, but the song about yearning for sun and light in the midst of winter, still creates associations to the mythical Christmas universe. The song was written by Christian Holm Isaksen (1877-1935), commonly known as Kristin í Geil. Only 23 years old, he became editor of the newly started national-oriented newspaper Tingakrossur. He stayed in this position, with a few years interruption, until the early thirties, where he had to stop because of illness. Kristin í Geil was known for his strong opinions, and deviated from the usual national-romantic track in favor of the naturalistic. He was a socialist and fought as a journalist for both national autonomy as well as for worker rights and poor people’s conditions. As a cultural figure, Kristin Geil also spread wide. He was one of the pioneers in Faroese painting and there are still many paintings made by him, among other places in the church of Sandavágur. Kristin was also an active amateur actor and translated and wrote plays for the theater scene in Torshavn. He also translated and wrote songs, and it might give you a glimpse of Kristin í Geil’s composite personality to name the three best known - the Danish socialist anthem, "Bratt lýsir í eystri" - "Kom og dansa" one of the most romantic Faroese songs based on the waltz from The Merry Widow - and then our own little Christmas song "Hví man tað vera ..?" On the front page of Føringatíðindi's December edition in 1891 is a little poem entitled Jola-Sálmur (Christmas Carol), signed FP. A rather anonymous presentation of the song which more any other has become synonymous with Christmas - not just in the Faroe Islands, but throughout the entire Christian World. The song, whose original title is "Stille Nacht", was presented for the first time on December 24th 1818 in Nikolaus-Kirche in Oberndorf, Austria. It was written two years earlier by the priest Joseph Mohr - and for the service in 1818, he had asked the head master and composer Franz Xaver Gruber to compose a melody for the poem. Gruber made an arrangement for guitar (unconfirmed stories claiming that it was because the organ in the church did not work), and the original arrangement was a bit merrier than we know it today, almost a dance tune in 6/8 time. It did not take long before the song began to conquer the World. In 1850 B.S. 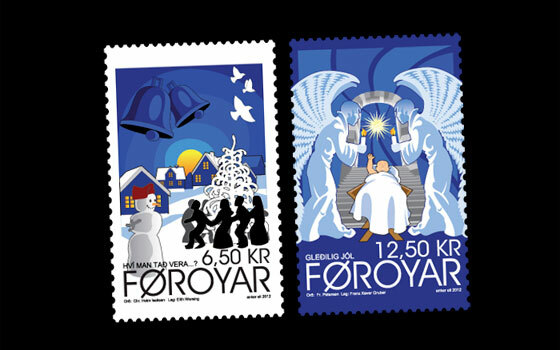 Ingemann translated it into Danish and in 1859 the American Bishop John Freeman Young translated the song into English under the title Silent Night - which today is the most familiar version. Exactly how many versions of Stille Nacht exist today is not known with certainty, but we believe that the figure is higher than 150. The initials FP stood for Fríðrikur Petersen 1853 - 1917, who at that time was vicar in Suðuroy. Fríðrikur Petersen became Bachelor of Divinity in Copenhagen 1880. After graduation he became vicar on the island Sandoy. From 1885 he served in Suðuroy, and from 1900 until his death in 1917 he was dean, based in Eysturoy. Fríðrikur Petersen was also a politician and a member of the Faroese Parliament from 1890 and from 1900 with a fixed seat in his capacity as dean. He was also a member of the Danish Landsting in two periods, from 1894 - 1901 and again from 1906 until his death. As a politician, Fríðrikur Petersen was conservative. In the great political division in 1906, which marked the beginning of the first political parties, he was one of the founders of “Sambandsflokkurin” (The Unionist Party) and was its president until he died. From his early youth, Fríðrikur Petersen was fascinated by the Faroese language. He was known as an eloquent speaker and competent preacher, and wrote some of the most beautiful songs and hymns of the national-romantic era. Among others the patriotic song "Eg oyggjar veit", which for a while was the unofficial national anthem. He translated the Lord's Prayer and the Articles of Faith into Faroese, but in the conflict that arose regarding the church language and whether the Bible should be translated into Faroese, he came to appear as an opponent to the Faroese language in the church. The question is whether he had any choice. As a church official, he had to keep to the standard requirement of an authorized translation from the original languages – a task that there was no capacity to perform in those days. Kristin í Geil and Fríðrikur Petersen - two very different men - and two very different songs on the same topic. But at least they had one thing in common - they both enriched Faroese culture and language with their talent.